Perhaps the most important vocalist of the twentieth century, Frank Sinatra is rivaled only by Bing Crosby in his contribution to American popular song. His smooth voice and uncanny sense of rhythm coupled by his tough-guy personality and deep sense of humor won him the adoration of jazz fans and the general public alike. Nicknamed Ol’ Blue Eyes and the Chairman of the Board, he is remembered today more for his classic work of the 1950s and 1960s than for his big band days. 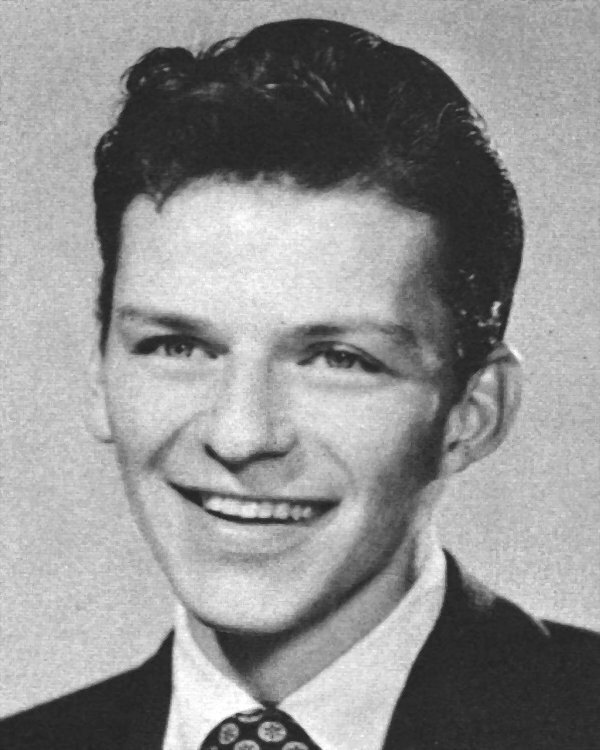 Born in 1915 and raised in New Jersey, Sinatra dropped out of high school to pursue a singing career. As part of the Hoboken Four, he won a contest in 1935 on the Major Bowes Amateur Hour and went on tour with the show. He then found work as a singing waiter and Master of Ceremonies at the Rustic Cabin nightclub in Englewood, New Jersey, where he received broadcast time. The story goes that vocalist Louise Tobin, then wife of bandleader Harry James, heard Sinatra sing on the radio one night in 1939 and alerted her husband. James liked his voice and hired him for his new orchestra. A disastrous tour, however, soon left the band in financial trouble and struggling to complete an engagement at the Sherman Hotel in Chicago in January 1940. Tommy Dorsey happened to be in town at the same time and having trouble with his then male vocalist, Allan DeWitt. He offered Sinatra a job. With Sinatra’s wife expecting and the band’s future uncertain, James let him go. Sinatra quickly become Dorsey’s star attraction. He remained with the band for more than two-and-a-half years, charting 16 Top Ten hits, including the classic number one “I’ll Never Smile Again.” He earned first place in Billboard magazine’s 1941 college poll for best male band vocalist and second place in 1942, barely edged out of first by Ray Eberle. He was back in first place for 1943. With his popularity soaring, Sinatra began to consider a solo career. To test the waters, he recorded four songs under his own name in early 1942 on the Bluebird label, with Axel Stordahl conducting. Confident in his chances of success, Sinatra resigned from Dorsey in September, leaving on the 10th after a concert in Indianapolis. The recording ban instituted by the American Federation of Musicians was in full swing by the time Sinatra emerged as a soloist. Though he was unable to record, he continued to tour and to appear on the radio. His defining moment came during a stint opening for Benny Goodman at the Paramount Theater in New York in January 1943. Young fans went wild over him. Girls swooned upon hearing his voice, and he was often mobbed by adoring fans. RCA Victor and Columbia capitalized on this phenomenon by issuing previously unreleased Dorsey and James vocal recordings which featured Sinatra. He soon signed with Columbia and skirted the ban by making several a cappela recordings. He also had begun to make appearances in film and earned an MGM contract. Sinatra charted several hits over the next few years and scored big at the box office, but by the late 1940s his career had stagnated. As the 1950s rolled around, his popularity was in decline. He continued making films and appearing on the radio, though in lesser roles. He also hosted his own television musical-variety program from 1950 to 1952. By the end of 1952, however, he was off the airwaves completely and without a film or recording contract, having left Columbia after a dispute over material. Aiming to make a comeback, he tightened his belt and signed a less-than-desired contract with Capitol Records. Soon he was charting hits again. He also took a non-singing role in the motion picture From Here to Eternity and impressed the film establishment so much that he was awarded an Oscar for Best Supporting Actor. He was back on radio also, in both a dramatic role, as detective Rocky Fortune, and as a singer. Sinatra continued recording, making films, and appearing on radio and television throughout the 1950s and 1960s. In 1960, he formed his own record label, Reprise, though he still was under contract with Capitol until 1962. He was prolific in the studio, often releasing three albums in one year. By the early 1960s, the market was oversaturated with Sinatra recordings and sales slacked off. The changing tastes of the America music buying public also began to take their toll. Though Sinatra was still a best-seller, he charted less frequently in the late 1960s, finding it hard to compete with modern rock and pop artists. He briefly flirted with the youth market, to some success, but in 1971 gave in and announced his retirement. Sinatra didn’t stay retired for long, returning to the public eye in 1973 with a gold album and a television special. This time around, though, he prudently decided to focus less on recording and more on live performance. Several years elapsed between album releases. He stayed out of the studio from 1984 to 1993 when he released Duets, on which he sang many of his old favorites accompanied by popular modern vocalists. It became his best selling album of all time. In 1994, he followed it up with Duets II. His health declining in the mid-1990s, Sinatra retired for good in 1995. Frank Sinatra passed away in 1998, after suffering a heart attack, age 83. McCarthy, Albert. The Dance Band Era. Radnor, Pennsylvania: Chilton, 1971. “On the Records.” Billboard 2 May 1942: 72. The Billboard 1943 Music Year Book Cincinnati: Billboard, 1944. 139. “The Columbia Sinatra.” Billboard 20 Nov. 1965: 125.